Long before she realized exactly what an oncologist is or does, Edith Mitchell was an intellectually hungry Tennessee farm girl who wanted to be a medical doctor helping people who were ill.
Today, Dr. Edith P. Mitchell, a clinical professor of medicine and medical oncology at Thomas Jefferson University in Philadelphia, has achieved her childhood goal. As a medical oncologist, focused on helping cancer patients, she is spreading the health care message on the national stage and working at efforts to increase the ranks of medical scientists and practitioners. 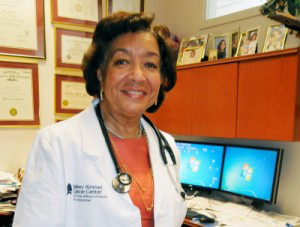 As the new national president of the more than 30,000-member National Medical Association (NMA), Mitchell is spending much of her yearlong term that began in August helping the nation’s oldest African-American organization of medical scientists and practitioners stay focused on health and medical trends. In the process, she has emphasized continuing to work on improving the health status, care and practices of people of color. “It’s very clear Americans are living longer; they are healthier,” says Mitchell. “Yet there are disparities. While everybody has improved, the gap between the races has increased,” she says, as she ticked off a list of health gaps between racial groups in America. Black men, for example, have the nation’s highest rate of prostate cancer and the highest rate of death from the disease, despite their share of the nation’s population, she says. Black women, meanwhile, develop more aggressive negative types of breast cancer at younger ages than peers their age in other racial groups; it proliferates or grows faster, too, relates Mitchell. Her list of concerns goes much longer. At Jefferson, where she heads the gastrointestinal oncology section for the teaching hospital’s Sidney Kimmel Cancer Center, Mitchell teaches medical students and physicians in training and conducts research and clinical trials. She is widely published in medical journals and volunteers for a variety of health groups. This comes on top of her principal interest: helping her hundreds of patients at the hospital. Acknowledging that “people are afraid of cancer,” Mitchell expresses a differing viewpoint. She says she has a desire to study cancer and work with her patients at Jefferson and colleagues there and elsewhere to explore what medications work for taming and, one day, successfully tackling the deadly disease. During breaks from her busy schedule at the university hospital, Mitchell makes her rounds across the country as president of the prestigious NMA. Her messages at each stop are like prescriptions, each designed for the specific patient or audience. This fall in Washington, D.C., for example, she presented at a health care forum during the annual legislative conference of the Congressional Black Caucus. Her message was part advice of what could be done locally and individually to help improve health and health care, while much of the rest of her presentation was focused on offering opinions, to those with an open ear, about what Congress should do to help boost the ranks of medical students and funds and people for health care research. Just before that conference, she was in Barcelona for a conference on cancer research and treatment. She has also been to the National Cancer Institute to talk about what it can do regarding cancer research. Other visits in future months, tentatively, include Tennessee State University (TSU), where her interest in science got a big boost while she was in high school from then-TSU student mentor Levi Watkins, the legendary heart surgeon at Johns Hopkins University who died earlier this year. With more support and encouragement from her science teachers at TSU, Mitchell earned a bachelor’s in biochemistry. She also hopes to visit the Medical College of Virginia, where she earned a medical degree in just three years, and Meharry Medical College, where she completed her residency. Mitchell’s travel schedule also includes Georgetown University, where she held a fellowship in medical oncology. Friends who have watched her skyrocket since her days on the farm are not surprised at Mitchell’s rise or the fact that she still frequently makes time to visit her roots in West Tennessee. She has a deep sense of home, having grown up on the farm her great-great-grandmother purchased after the Civil War from the owner of the plantation on which she lived and worked. “She was as smart as a whip and quiet as a mouse,” says retired Delaware school teacher Glory Taylor Scretchen. She has known Mitchell since childhood. They attended college together and have stayed in touch since. “She had internships galore,” says Scretchen, noting fellow college classmates admired Mitchell’s focus.